NTS Chambly is a combination of two labs focused on serving the aerospace, defense and transportation sectors. Established in 2000 as Fiarex Testing Laboratory and CEM Testing Laboratory, these Montreal labs joined NTS in 2017 to bolster our already extensive range of test services that range from dynamic and mechanical testing to salt-fog corrosion, altitude and vacuum testing. As our wide range of clients have come to expect from us, all our services at this location are delivered by an experienced and resourceful team that is dedicated to meeting the testing needs of our aerospace, defense, transportation and other client partners. 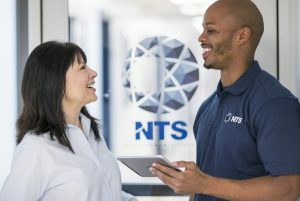 Product validation can be made at various stages of development, and NTS has the expertise to perform validation of prototypes, product robustness limits and product qualification. 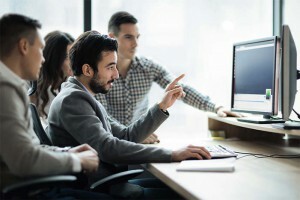 Our expertise facilitates the analysis of product reliability and robustness improvement using the most advanced techniques. NTS offers acceleration testing, mechanical shock testing (free-fall and shaker), transportation simulation, free-fall drop testing, tensile, compression and cycling, HALT, foreign object impact resistance and vibration testing. Mechanical shock testing aims to measure the response of a component or product to extreme and sudden acceleration or deceleration within a controlled test environment. At NTS, we use wide-band, multi-channel data acquisition technology to document the item’s response. Our engineers subsequently analyze this data to evaluate performance. Hydroshock Testing Generated by Air Gun: A blast of air is fired into water, generating shock waves. Drop Testing: Items are dropped from heights of up to 80 feet — or 24 meters — in order to test their ability to withstand mishaps that could occur during handling or transportation. Drop Towers: Using our drop towers, we can produce mechanical shock with peak accelerations of more than 20,000g — or 196,000 m/s2. Variable Force and Free-Fall Testing: This wide range of techniques can produce shocks of up to 15,000g — or 147,000 m/s2. Pyrotechnics Testing to Simulate Pyro-Shock: This type of testing is critical to ensure safe spacecraft flight, since pyro-shocks are frequently encountered during the separation of rocket booster stages. In addition, it is important for the safe firing of weapons or detonation of ordnances in military applications. Shipboard Shock Testing: We perform this type of testing to MIL-DTL-901E. Simulated Catapult Launch/Arrested Landing Testing: This test is performed per MIL-STD-331. Highly Accelerated Life Testing — or HALT — and Highly Accelerated Stress Screening — or HASS — are testing methods used to pinpoint any issues with or defects in your product in its early stages of development. Both methods are aimed at placing wear and tear on a product at a highly accelerated pace. HALT is typically used to uncover a product’s weak points by incrementally applying high stress levels for short periods of time until the product shows signs of degradation or failure. Based on this data, manufacturers can then take corrective action to improve the item while it is still in the design or development stage and before it goes into production. HASS testing focuses on defects during the manufacturing process. It builds on the results of HALT and leverages them to optimize the manufacture of a product. It can also be used to determine how the use of alternative processes, materials or components will impact the end product’s functionality and durability. The conformity to electromagnetic compatibility and electromagnetic interference (EMC and EMI) norms and regulations is a crucial step in the development of every electric and electronic product. Whether you need engineering, technical training, testing or design analysis, our team of experts delivers customized services to ensure you can quickly develop your product and bring it to market without defects. Our labs are outfitted with state of the art equipment and staffed by experienced technicians and engineers with extensive expertise in EMI/EMC testing and compliance. To view all EMI / EMC testing services at our Bouchervillelocation, click here. Temperature and humidity are the two leading environmental stressors that affect manufactured products. Fluctuations in temperature cause items to contract or expand. Humidity also causes contraction and expansion, and it can also lead to corrosion and oxidation that can adversely impact parts and component. This is especially important for products that contain computerized or electrical components. At NTS, we design thermal shock, humidity and thermal cycling testing to meet our clients’ specific needs. Moreover, our experienced staff knows how to take any relevant standards into account, such as MIL-STD-883, MIL-STD 810 and MIL-STD 750. Our climatic testing services include salt fog testing, which measures the ability of electric components and protective coatings to tolerate corrosive environments. One of the salt-fog corrosion tests we frequently perform ensures compliance with ISO 9227:2012 standards. We also perform altitude testing, including testing to meet RTCA DO-160 standards, as well as vacuum testing. At NTS Chambly, we offer customizable pressure and fluid susceptibility testing as part of our hydraulics testing services to give our clients peace of mind that their products can withstand pressure, as well as any fluids — such as fuels or lubricants — that could contaminate systems if not properly designed and manufactured. NTS is the primary choice for many high tech manufacturers when it comes to the simulation of product behavior under intense environmental conditions. We can simulate key conditions, including thermal shock, high and low temperature conditioning, humidity, thermal cycling, salt-fog corrosion, altitude, vacuum, pressure and fluid susceptibility. For more information about the NTS Chambly location, click here to download the fact sheet. Or simply Request a Quote for your next project now.